The fun just doesn’t stop at the County Museum at Hartlebury Castle this summer. Throughout the holidays there are activities for the whole family to take part in, from castles and dragons to getting creative with recycled materials, there is something for everyone. Each week of the holidays on Tuesdays, Wednesdays and Thursdays throughout August (10.30am-4pm) children can join in with a range of exciting themed activities. Each day includes a mixture of interactive sessions, hands on craft activities and a Castle Explorer trail. 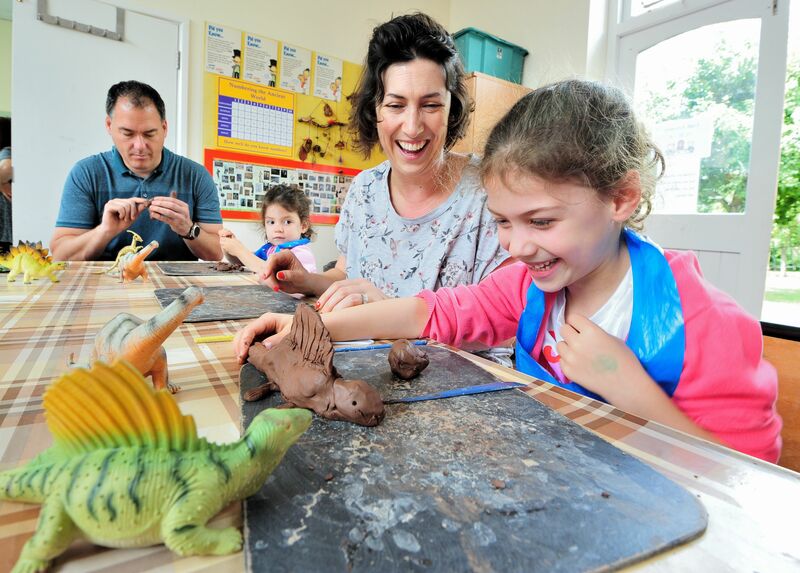 Every week is different so visitors can always find something new to try: This week there are story telling sessions and the chance to make a teardrop sun catcher and a clay Jurassic dinosaur. Next week the theme is Art Attack when children can make a beautiful butterfly collage plus taster art for families to try including charcoal, pastels and brass rubbing. In the last week of August the County Museum is holding their big Bank Holiday Monday family event 'Awesome Owls & Fantastic Falconry' where visitors can get up close to a fantastic host of birds of prey and watch them soar over the Castle. Visitors can meet owls from Chelmarsh Owl Rescue and children can follow the explorer trail, decorate their own miniature bird house and make an owl mobile to take home. County Museum Events Officer Pippa Ashmore said: "It can be hard to know how to keep children entertained through the long holidays, a visit to Hartlebury Castle is affordable fun for the whole family. "Throughout the summer we have plenty to keep families occupied with different themed weeks. Everything from Telling Tales with storytelling sessions to Eco Warriors, so families can visit more than once and be assured of finding different activities to delight and inspire them as well as learning something new." As well as enjoying Summer Fun visitors can explore the new developments at Hartlebury Castle including marveling at talking portraits, promenading the Long Gallery and following in the footsteps of royalty as they stroll around the moat on a new walk revealing the grounds for the very first time. Photo supplied shows families enjoying Summer Fun at Hartlebury Castle. For more information or images please contact Helen Large on Helen.Large@worcester.gov.uk or call 01905 25371. Hartlebury Castle is open 1 February – 23 December, Tuesday – Friday 10am – 5pm, Saturdays, Sundays and Bank Holidays 11am – 5pm. Hartlebury Castle is situated off the A449, three miles south of Kidderminster, ten miles north of Worcester. Activities for the whole family to take part in throughout August, from castles and dragons to getting creative with recycled materials. Come and make crafts that link in with our story telling sessions, including making a teardrop sun catcher and a clay Jurassic dinosaur! Story telling at: 11.30am and 2.30pm. Week 2 (7 - 9 Aug) – Art Attack! Get involved in our butterfly collage project and make some arty crafts to take home. We will have some taster art for families to try including charcoal, pastels and brass rubbing. Find out all about castles and fortifications with displays and hands on activities, including making your own Hartlebury Jumping Jack Dragon and pop up castle. Get creative with recycled materials including CDs, bottle tops and card. Make a CD peacock and your own construction using plastic bottles, containers and solar panels. Meet owls from Chelmarsh Owl Rescue and enjoy decorating a miniature bird house and making your own barn owl mobile to take home. Hartlebury Castle has been home to the Bishops of Worcester for over 1000 years. First given to Bishop Aelhun in 850AD, the Castle continued to be the bishops’ residence right up until 2007. Over this time the Castle became a defence point against Welsh invasion, a prison for Royalist soldiers and a First World War convalescent hospital, all while continuing to be a family home. The Castle’s bishops include three who became saints, two were burned at the stake for their faith, one refused to crown Queen Elizabeth I and one was present at the execution of Mary Queen of Scots. Museums Worcestershire is the joint museum service of Worcester City and Worcestershire County Councils. It comprises three fantastic venues– Worcester City Art Gallery & Museum, the Commandery in Worcester and The County Museum at Hartlebury Castle. The collections and exhibitions at our sites are many and varied, covering centuries of the county's history right up to the present day. Thousands of objects, including the historic buildings themselves, are brought to life through innovative exhibitions and events throughout the year.